Dr. Ronald Chesbrough became the 29th president of Cazenovia College on July 1, 2016. 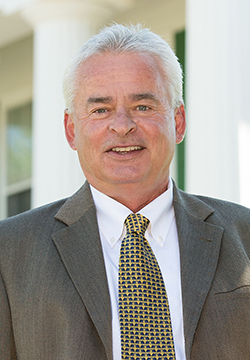 He has over 25 years of higher education leadership experience including most recently as president of St. Charles Community College in Cottleville, Missouri. Before leading St. Charles Community College, Dr. Chesbrough served as vice president for student affairs at Hastings College in Hastings, Nebraska, from 2005 to 2011. Prior to that, he was at Johnson State College in Vermont as dean of students from 1993 to 2005 and director of Upward Bound from 1989 to 1993. Other positions held by Dr. Chesbrough include director of service learning programs at Trinity College and associate director of career services at Champlain College, and director of co-curricular learning at Rock Point School. Originally from Northern New York, Dr. Chesbrough earned a Bachelor of Arts in psychology and economics from the State University of New York at Potsdam, a master’s degree in organizational and human resource development from the University of Vermont and his doctorate in higher education leadership from the University of Nebraska-Lincoln. In addition to his academic leadership experience, Chesbrough has a history of involvement in leadership roles in community and professional associations. He served as chair of the St. Charles Economic Development Corporation Executive Board and chair of the Missouri Community College Association Presidents/Chancellors. He and his wife, Annie, reside in Cazenovia and have three adult daughters and two at home.